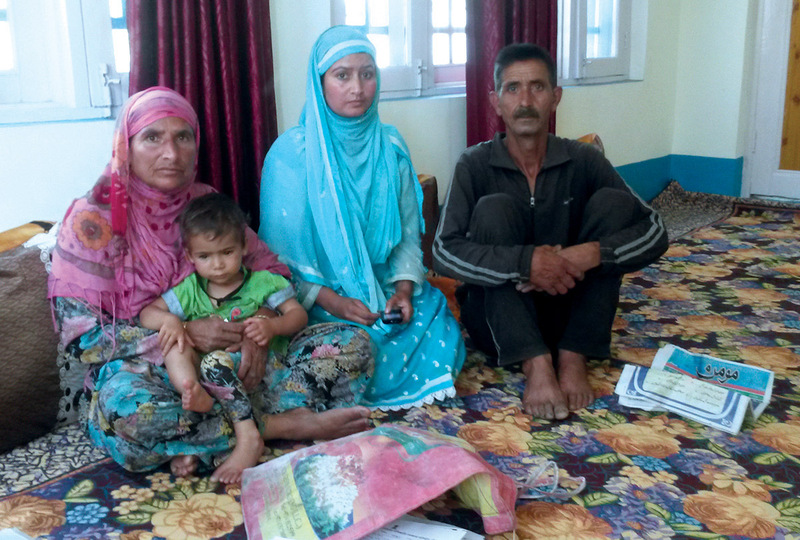 Abdul Rahman Ganie, father of slain Aabid Ahmad Ganie, with his family. Abdul Rahman Ganie and his five daughters live in Larson, a small, sparsely populated village with the pastoral hinterland. Dusky, it is located in the hem of a bare mountain on Bandipora road in Ganderbal. Ganie’s house is on the road. What makes it distinct is a small granite slab attached to the main door that carries the name of Aabid Ahmad Ganai written in beautiful Urdu. “If you want to reach my home, ask anyone in the Ganderbal where Aabid Ahmad Ganie’s family lives and they will guide you,” his sister Firdousa Rehman told me at a scrap factory in Zakura Srinagar where she works to help her family. The house was constructed after Aabid’s mysterious death. His father got his dead son’s name inscribed on the wall and this gives it a distinct identity. For the village, Aabid is a martyr. 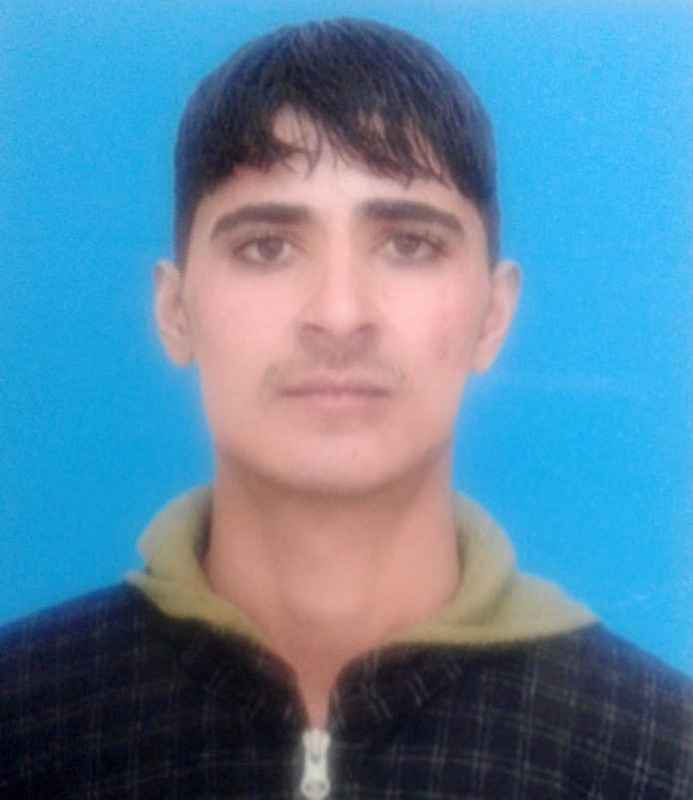 Aabid was allegedly killed in July 2013 in Bhim (Rajasthan). He was a student at Dar-ul-Uloom Fazani Madini, an Islamic seminary in Ahmadabad (Gujarat). Somehow, later, Aabid and his friends got her convinced that he will have to be enrolled in Ahmadabad for further Quranic studies. In his stint in the local seminary, he had impressed everybody by his conduct. The drive to send him to a better seminary was so strong that even neighbours came forward with help if required. Eventually, in early February 2013, Aabid left for Ahmadabad to attend a seminary for religious education. Within days of his joining, Aabid outshines his peers. “He impressed his teachers so much that one of his teacher, [by the name]Baba Jani, gifted him a Taveez [Amulet] for his protection from evil eye,” Mughli recalls. She says that his teachers had predicted about him that one day he will become a great teacher of the seminary. He visited home twice later. “But they (his murderers) did not let him make his fourth visit,” Mughli breaks down. Five days before the onset of Ramzaan 2013, Aabid made a call to his mother informing her that he will be coming home for fasting and to perform Aatikaaf (staying in isolation in prayers in the mosque for last 10 days of teh month of fasting) at Srinagar’s Aali Masjid. He asked for Rs 2000 for travel. “I told him that I will deposit only Rs 1000 right now, once you reach Delhi or Jammu; I will deposit the balance sum,” Mughli remembers telling her son. Next day he left for his home. After traversing some 25 Kms, he reached the bus stand. He called his mother again asking to send more money. “I told him, you book the ticket and get on the bus; I will send you more money.” That evening Mughli called Aabid to know his whereabouts. The response was surprising. Aabid told her he met a person at the bus stop who insisted he will take him to a highly reputed seminary in Rajasthan. Aabid used to wear a green amama (the signature turban of Madnis’). The stranger had lured Aabid on the pretext of conferring him with a much worthy Molvi course certificate and getting him to perform his Aitkaaf in Madina. He had promised Aabid free accommodation and food. Aabid’s sister Rukhsan Rehman talked with this man on the phone who assured her that he will take good care of his brother. Rukhsana, a graduate, is the only one in the family who can talk in Urdu and Hindi. His friendly response convinced the family to let Aabid go along with him. Aabid sought more money to get a bicycle on rent because he will have to travel 25 km daily to reach his new seminary. Trepidation and anxiety overtook Mughli. She told he husband Rehman to sell her gold earnings and arrange Rs 3000. “That was the only thing available at home and my son’s life, was more valuable than our whole property,” Mughli said. Aabid called her again seeking a police certificate along with money. He had also called his Ahmadabad teacher and informed him about the danger to his life. He had been advised to leave the place somehow. Then the stranger who had lured Aabid to Rajasthan rang up Aabid’s sister Rukhsana telling her they cannot be contacted for next three days. “He told me that they have to go very far off place where they have to perform Aitkaaf,” Rukhsana says. During these three days Aabid’s family was very much worried. They were trying his number repeatedly but there was no response. “On July 14, at 11 Am in the morning, Rukhsana receives a phone call from Police Station Tulmulla Ganderbal,” Mughli breaks down for the third time during the conversation. She starts beating her chest. The police had informed Rukhsana that Rajasthan police has recovered Aabid Ahmad Ganie’s dead body in Bhim (Rajasthan). Bhim is located more than 400 Kms in the north east of Ahmadabad. Aabid’s news of death triggered protests in Ganderbal and there were clashes between protestors and police. On July 15, 2013, Aabid’s two uncles, Mohammad Maqbool and Mohammad Yasin, left for Rajasthan to receive the body. They drove teh body to AIIMS for medico-legal formalities and flew to Srinagar. The state government funded the transportation of the corpse and their travel. “Thousands of locals took the body and stage a sit-in before DC,” Arifa, his younger sister said. “Tanveer Sadiq, political secretary of Omar Abdullah, appeared on the scene and managed the situation.” They were promised a job and investigations in the case. In February 2014, two cops of Rajasthan police showed up at the house of Aabid Ahmad Ganie, carrying summon to appear before the court. A few days later, Rukhsana, the only literate member in the family, decided to travel to Rajasthan to appear in the court and see where has the case reached. “I wanted to see if anyone has been arrested so far,” she said. Her maternal uncle accompanied her. In Bhim court, she found out that she was summoned to sign on a blank paper against a compensation of Rs 50,000. “The clerk in the court had asked her to sign on a paper wherein he was going to declare that my brother has died of drowning and I had no objection in allowing him to close the file,” Rukhsana said. “I protested and refused to sign. He warned me to either name the killers else he is going to close the file.” At a nearby desk, an agent of an advocate saw Rukhsana arguing with the clerk. He took Rukhsana and his uncle aside to understand the argument. After listening to their plight, they were introduced to a lawyer. After examining the file, the lawyer said Aabid’s body was recovered near a cesspool which is three feet deep. During her stay, Rukhsana met the witnesses in the court who revealed that they had seen Aabid coming down from a vehicle, panting and running away with a backpack. “The other witnesses I met were construction workers and they were the one who informed the police that they had seen the corpse of a boy near the cesspool,” Rukhsana says. Maqbool, Aabid’s uncle, alleged that in Delhi a CID official from Jammu and Kashmir government had removed a copy of post-mortem report from the medico-legal file. “His body had marks of torture on vital parts,” Maqbool reveals as having seen. In the original post-mortem report, the lawyer told the family, Aabid’s stomach was found empty, “which means he had not eaten anything for days as he was scared of being killed,” Rukhsana said. The police have recovered Rs 2000 and an ATM card from Aabid’s possession which is part of the case file. After a week Rukhsana and Maqbool returned home never to go back again to attend the court. On May 27, 2014, the then Chief Minister Omar Abdullah held an Awami Darbar at Ganderbal. Ruksana appeared before him, insisting of being treated unfairly. “He said, your brother was killed, so be it, we can’t do anything, we cannot provide you compensation or employment,” she quoted Omar telling her. After a few months, the lawyer called Rukhsana and asked her to come at least once for one full month to take the case to its conclusion. “He says that he will get the murderers of Aabid arrested if I appear and bear witness in the court,” Rukhsana says. “I have to listen and recognize the voices of suspected murderers in the court as I had talked on the phone with the stranger during that time when my brother was with him,” she said. What is preventing her is the costs it entails: Rs 100 thousand, at least including the lawyer’s fee. “We don’t have money,” she regrets. The family is sure Aabid was murdered. They don’t believe in theories of downing. They want killers of their only brother brought to justice. But nobody is helping them even in getting justice.